Beat cream cheese with electric mixer until smooth; add Crema Agria, sugar and orange peel; mix well to blend. Pour into prepared crust and spread evenly over bottom. Refrigerate at least 4 hours. 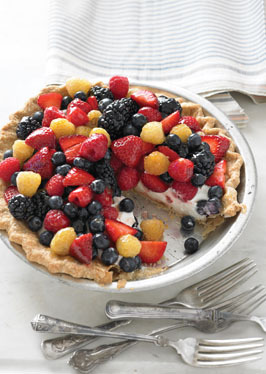 Thirty minutes before serving, arrange berries over top of of pie. Brush marmalade over top of berries. Refrigerate at least 30 minutes before serving. *Raspberry jelly can be substituted.